At the age of sixteen, Nancy Hilliard Joyce was accepted into the Governor’s School for the Arts. For over 10 years she lived in Manhattan and then New Jersey as a working artist. For five years, she served on the Board of Trustees at the Asheville Art Museum and was an active member of the River Arts District Association in Asheville, NC. Today, Nancy is a board member of The Governor’s School for the Arts Foundation as well as The Cabarrus Arts Council Board. She is the Art Curator for multiple boutique hotels and she regularly produces large-scale commission work. 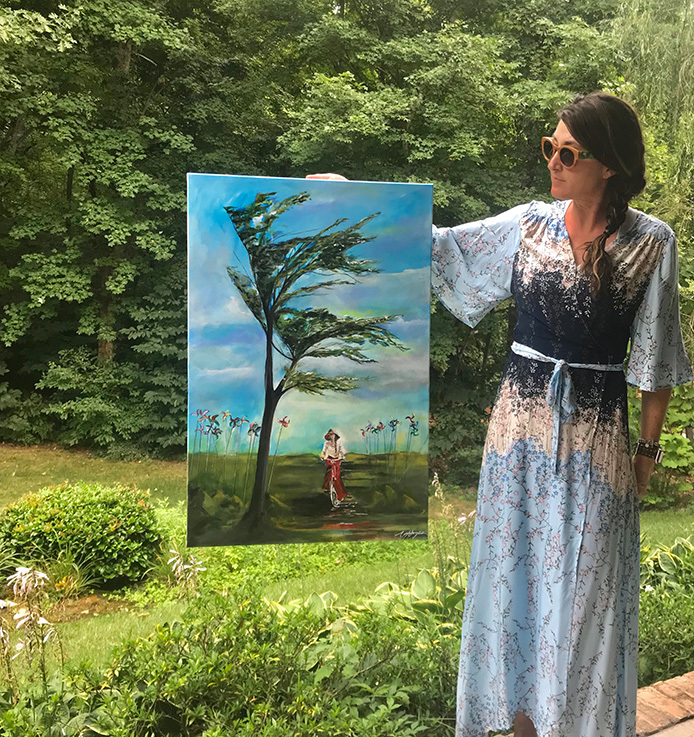 Nancy is passionate about giving back to the environment, women, and children in need and uses her art as a platform to raise money for charity and non-profit organizations. Nancy’s paintings are intricate in form and filled with layers of color, perspective, gestures, and expression. Her contemporary, mixed-media art is often created with modeling paste, a range of synthetic polymer paints, various handmade papers and detailed with touches of oil paint. She will sometimes sand or wipe down layers to reveal underlayers while building up other sections to create texture and depth; a process that may go on for weeks or end in just a day. Nancy’s work is appreciated and widely collected throughout the United States in many homes, hotels, corporate offices, and airports. She is known as a contemporary, mixed- media artist with an Americana flair. To follow Nancy’s daily art feed, follow her page on Instagram or Facebook @NancyJoyceArt. Two, fourteen-foot triptych commission pieces set to install into the Greenville-Spartanburg International Airport. In Fall of 2015, Nancy raised funds from her art show, “Bicyclette”, to travel to remote regions of Cambodia and deliver over 250 all-terrain bicycles to young, underprivileged girls. These bicycles were distributed at a ceremony where Nancy spoke through a translator about the importance of education and self-esteem in young girls. Art Consultant for Greenville, SC’s Downtown @RiverPlace Embassy Suites. A permanent installation of her 75″ x 148″ triptych painting in South Carolina’s newest mixed-use hub building called, ONE. Nancy curated an installation for a group of select artists in Western North Carolina. She has several large-scale pieces on the walls of EDISON’S, which is located inside the historic OMNI Grove Park Inn. In January of 2014, Nancy partnered with Girls on the Run of Western North Carolina to create a body of work titled, “Thirteen”. This exhibition showcased 13 historical and influential women which included large-scale paintings of Rosa Parks, Annie Oakley, Sacagawea, Amelia Earhart and Joan of Arc, just to name a few. During the Summer of 2014, Nancy created a one-of-a-kind painting for Green Man Brewery which was used for the label of a seasonal, wet-hopped IPA beer. In 2015, Nancy partnered with Organic Records and Mountain Home Music Company as a conceptualizer and artist who paints large-scale works that are then spun into CD covers and released on National levels.